I go to visit our fallen soldiers; those that have fallen in the many wars of this great nation, those who have died in its service, those who have lived – veterans, and wives of those soldiers buried within. I visit with respect and heart felt love for these men who have paid for the freedoms we all in this nation and other free nations enjoy. I read the names of these men, my brothers, as I walk along the graves feeling sadness in heart at times so strong I would have to hold back tears. I love these men because they are what is good in America and Americas best sons. It was on one of my visits to Fort Rosecrans National Cemetery while walking I noticed this young lady walking. Her walk I notice was different, her walk was sad and I could see she was distraught. 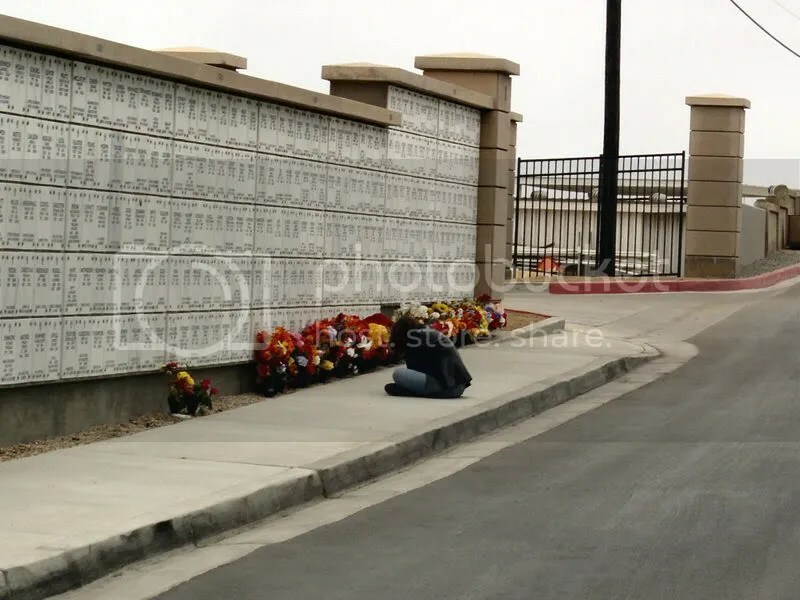 I watched as she walked to the wall there the newest of our fallen soldiers have been buried and touched a grave and then sat with her face resting in her hands crying. How bad I wanted to go to her and comfort her, how bad I want her to know how much I too mourned her loss, how bad I wanted to tell her how proud I was of her fallen soldier. I had no words; I knew not what to say… my heart grew heavy and I left the cemetery holding back my tears.